Due to user feedback vessel costing has changed in this build. Each vessel now has a single ‘Cost per day’ and there is no ‘Cost per day shooting’. For users with older files that included a ‘Cost per day shooting’, we recommend visiting the Vessels dialog and updating vessel costing. In previous builds, ‘width’ in a turn pattern referred to the number of lines spanned in a single turn. For instance with a turn pattern width of 8, a vessel would have turned from line 1 to 8, then 2, 9, 3, 10, etc. ‘Width’ now refers to the total number of lines in a swath. For instance with a turn pattern width of 8, a vessel will now shoot an 8-line swath in the order 1, 5, 2, 6, 3, 7, 4, 8. Obstructions can now be imported from shapefiles (.shp) as well as a range of other common file formats: text, P1-90, AutoCAD (.dxf), KML, MapInfo (.tab, .mif), and .dat. To import obstructions, simply right-click in the map and choose ‘Import Obstructions’ from the Obstruction context menu, then browse for the file in the Import Obstruction dialog. This turn pattern divides the number of lines and starting position in a patch evenly according to the number of source vessels. Example: A patch with 45 lines and three source vessels: Each vessel will be allocated 15 lines. Vessel A will start on line 1 and complete lines 1-15, vessel B on line 16 and complete lines 16-30, and vessel C on line 31 and complete lines 31-45. Within its allocated lines, each vessel will complete racetrack turns of a specified size. The screenshot shows a racetrack width of 1 for each vessel. Usability: Timeline window now has a scrollbar to allow for easier viewing of multiple source vessel timelines. Usability: Vessel cost settings simplified to a single ‘Cost Per Day’ for each vessel. Fixed: Incorrect zoom and source vessel start location if the receiver area polygon includes negative northing coordinates. Fixed: Patch Shot Outline outlines patches other than the current patch. Fixed: Crash on cancelling a survey rebuild after adding an obstruction and then pressing ‘Cancel’ on the Survey Properties dialog. Fixed: Source duration unnecessarily increased due to the same vessel always shooting the extra line, where there is an uneven number of shot lines on a multi-vessel project. Fixed: Source lines pattern built in the wrong direction when receiver lines in an imported file are listed in east-west order. Fixed: Patches being highlighted as ‘current’ when they are not current, in certain configurations. Fixed: Some source vessels starting at the wrong times, on multi-vessel rolling spread projects. Redesigned user interface, featuring much more map-based editing and fine-tuning capability. 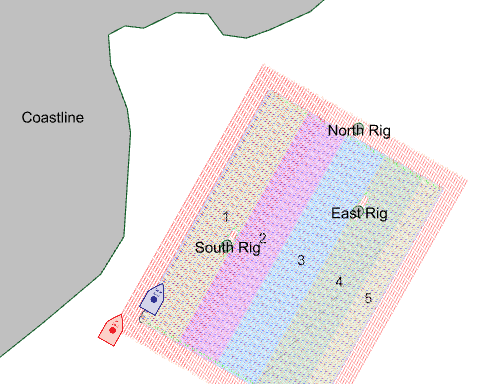 Improvements to source lines pattern functionality, to cater for a wider range of survey configurations. Inline and hybrid rolling spread options. Obstruction handling improvements and bug fixes. Wider range of configuration options to handle receiver cable/node-on-rope snaking and the use of buoys. Tiling (a.k.a. 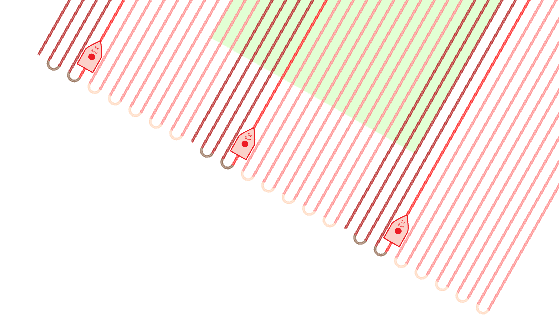 zippers): Dividing a survey into patches or ’tiles’ of less than the full receiver line length, based on a rectangular grid. Lay ahead a specified number of lines or specified length of cable/rope.